Google Calendar FREE SMS ~ Philippine Freebies, Promos, Contests and MORE! If you're like me who sometimes forgets an important appointment or event, here's something you may want to do. Google calendar has been around for some time now and it's only recently that I found out that google calendar can send SMS notifications to mobile phones absolutely FREE! So for instance you have an event scheduled tonight at let's say 7PM. You can send an SMS reminder at the start of the day or a couple of hours before the event happens. This way, you don't forget it during your busy day. Here's a tip from Lifehacker on how to easily add events to your google calendar using your browser's address bar. I'm trying to import my event calendar from rememberthemilk to my google calendar but unfortunately google calendar are having some issues so I have to use the method I mentioned above. 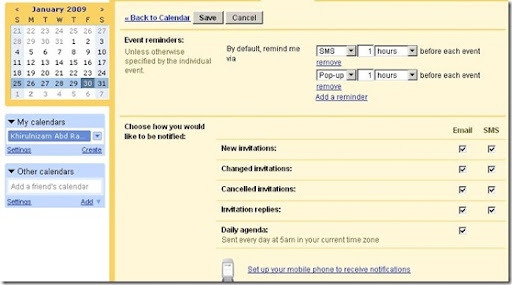 Read more on how to set up SMS notification of you Google calendar on Google's calendar help page.